In this bulletin we will feature something new - the success of a Job Training grant. 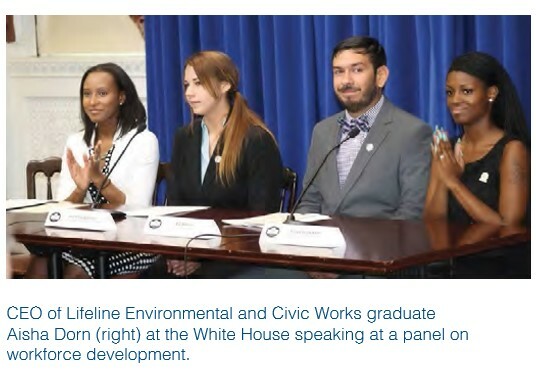 Over nearly two decades, the U.S. Environmental Protection Agency's (EPA) Environmental Workforce Development and Job Training program has helped put people to work by building a skilled environmental workforce across the country. The program awards competitive grants to nonprofit organizations and other eligible entities to recruit, train and place unemployed and underemployed individuals, including low-income and minority residents of solid and hazardous waste-impacted communities, in a wide range of environmental careers. By doing so, EPA is helping unemployed individuals develop skills they can use to find sustainable careers that advance social, economic and environmental betterment and make a living wage. EPA has awarded Civic Works, Inc., located in Region 3, Environmental Workforce Development and Job Training grants. In 1950, Baltimore was the sixth largest city in the country, home to 950,000 people and a thriving manufacturing industry. But a nationwide decline in this sector cost Baltimore more than 100,000 manufacturing jobs by 1995, or 75 percent of its industrial employment. This shift contributed to an economic decline that lingers today, with 8 percent of the city's population unemployed and nearly 24 percent living below the poverty level. The drop in manufacturing also left a high concentration of abandoned properties and brownfields. The city has an estimated 1,000 brownfields, totaling 2,500 acres. As a result, the demand for environmental technicians is high, especially in lead and asbestos abatement, and environmental site assessment, inspection and sampling. The Civic Works Baltimore Center for Green Careers provides brownfields remediation training through its B'ore Green program. "The program is making Baltimore's economy more equitable and sustainable by training residents for jobs in the environmental sector," says Gicelle Fundales, Director of Training and Production at Civic Works. Participants in the program include local, unemployed and underemployed residents; single parents; previously incarcerated individuals; veterans; and dislocated workers. Since 2005, 43 percent of participants have been veterans with significant barriers to employment. Seventy percent of participants were formerly incarcerated or have a substantial history of arrest and conviction. "Most participants have had some interaction with the criminal justice system, often in part because they cannot find a job," says Fundales. "In some cases, folks arrive at the program literally right out of prison. Helping them establish stable careers reduces recidivism." B'more Green ensures that local Baltimore companies that are engaged in brownfields cleanup and revitalization projects have access to a trained and ready workforce. "We look forward to working with B'more Green graduates," says Paul Hayden of Geo-Technology Associates, Inc. (GTA), a professional engineering firm providing land and property enhancement services. Hayden's firm partners with Civic Works by training program participants in environmental assessments. GTA has hired six graduates as engineering technicians to work on remediation projects at several of Baltimore's largest brownfields sites, including Canton Crossing Retail, Union Wharf and Union Mill. These technicians assist in environmental site assessments; soil, ambient air and groundwater sampling; soil remediation; asbestos and lead-based paint surveys; and standard construction observation and testing work. In 1996, a cross-section of stakeholders came together in Pittsburgh for the very first federally co-sponsored National Brownfields Training Conference. Now more than two decades later, Brownfields 2017 is coming back to the city where the brownfields cleanup and redevelopment movement started to roll. Cosponsored by the U.S. Environmental Protection Agency (EPA) and the International City/County Management Association (ICMA), the National Brownfields Training Conference will take place December 5-7, 2017, with pre-conference programming on December 4th, in Pittsburgh at the David L. Lawrence Convention Center. Offered every two years, the conference is the largest gathering of stakeholders focused on cleaning up and reusing formerly utilized commercial and industrial properties. Featuring dozens of educational sessions and mobile workshops, including many showcasing the Steel City and the revitalization of the surrounding region. The exceptional training offered by the conference includes something for both beginners and seasoned professionals. The conference is also a premier stop for the private sector as many events including a vibrant exhibit hall and other transactional activities are catered towards companies doing the business of brownfields cleanup and redevelopment. The exhibit hall will feature upwards of 150 booths housing federal agencies, engineering firms, developers, environmental cleanup companies, legal and financial expertise, nonprofits, and other types of organizations. The educational program for every conference is selected from hundreds of proposals submitted through a call for ideas process. The Brownfields 2017 Call for Ideas is now open through March 17th at www.brownfields2017.org. Start planning your submissions now. I started working at OBLR in November of last year, and I'm happy to say that I've hit the ground running. I work primarily alongside Kelly Gorini helping to manage our various data systems, particularly ACRES. I also work on data improvement and analysis projects; my hope is that we can continue to improve the already impressive story we tell about our program. As I learn more and more about our program, I am amazed at all we manage to accomplish. I feel very lucky to be working with such a great team! Before joining the staff at OBLR, I was a Peace Corps Volunteer teaching English in the Republic of Georgia. I am a Region 2 native, born and raised near Rochester, NY (where I hear a lot of great Brownfields work gets done!). The AWP reporting home page has been completely redesigned! You are now able to provide specific information about your project area, including area-wide boundaries, catalyst/high priority brownfield site(s) details, project leveraging, type(s) of reuse planned and project web links. You can also report your implementation activities, share brownfields redevelopment updates and associate existing ACRES property records from brownfield sites within the same project area. These improvements to the home page were made to help you share more details around your specific project area, record important information about key brownfield sites and track a variety of accomplishments in a more consistent way across different AWP project stages. If you are updating AWP information for the first time and need a hint on how to start, here are the 'quick clicks' you'll need: 1) click the 'My Cooperative Agreement' tab on your home page, 2) click the link to the AWP Cooperative Agreement (CA), 3) click on any of the tabs to move from page to page as you enter AWP information, and 4) be sure to click the 'Save' button on each page. To have your project officer review the information, click the 'Review & Submit' tab, scroll to the bottom of the review page and click the 'Submit' button. The ability to identify jurisdiction information for a CA has been added back into the project officer's 'Manage This Cooperative Agreement' function. To access this feature, navigate to the 'My Regional Cooperative Agreements' tab and click the link for a specific CA. At the top of the CA Home page, click the 'Manage This Cooperative Agreement' button and scroll to the Jurisdiction Information section. Select a state/territory and a Jurisdiction Type; then click the 'Search Jurisdictions' button. A list of available jurisdictions is displayed. Click the 'Associate Jurisdiction' button next to the appropriate line and it will appear in the jurisdiction table. This information will be passed to CIMC during the monthly ACRES-CIMC update process (18th of each month). The option to display draft accomplishments (work packages awaiting approval) has been added to the PAR. To include draft accomplishment statistics and details, click the box for 'Draft Data (awaiting approval)' in the Optional Selections column. Then click the 'Run Report' button. When selecting draft, note that ONLY draft (no final) accomplishments are displayed. Under a cleanup grant, when a property has all the information needed to qualify as an accomplishment, ACRES will display the status "Cleanup pending approval" on the Property Home page (Cleanup section). Previously this message also included the fiscal year in which the property met accomplishment requirements. However, the accomplishment is counted in the year the cleanup is approved, not the year requirements are met. Because verification and approval can take some time, this created some confusion when the 'pending approval' year did not match the approval year. The accomplishment table at the top of a PO's home page has been modified to exclude ARRA accomplishments. ARRA accomplishments do not count towards annual targets and are therefore not included in either PAT or PAR counts. Removing them from the PO Home page provides consistency in annual accomplishment reporting. If a PO wishes to view ARRA statistics, these are available as an alternate option on the PAR to list only ARRA. "In the spring I have counted one hundred and thirty-six different kinds of weather inside of four and twenty hours." When entering your data into ACRES, it's critical to have the correct properties associated to your Cooperative Agreement (CA). As we've discussed before, sometimes you need to create your property records from scratch, but many times your properties may already be in ACRES, and all you need to do is associate them to your CA. Having the correct properties associated to your CA is even more important now that many of you are taking advantage of the new ability of ACRES to help assessment and cleanup grantees generate your quarterly reports for your Project Officer. From the CA home page, click the "Enter Data" link next to the property you want to remove. This brings you to the Property Profile Form data entry screen for that erroneous property. At the top of the first page (Part 1) check the box where it says "Mark this property for Deletion or mark to Disassociate from the CA"
The duplicate property option is for cases where you have accidentally entered a redundant or duplicate property record that had previously been entered. This will ultimately make your accidental duplicate record disappear. The cancelled option is good for sites where either you didn't have enough money left to fund it, you ran out of time under your grant, the site owners withdrew from your program, or redevelopment plans changed such that your program is not needed. The "Not a Brownfield Property" option is best used in cases where an invalid or nonexistent property has accidentally been added or a property initially entered is later determined to be ineligible. If your case doesn't fit any of these scenarios, then check "Other" and enter an explanation in the open response field below it. Once the property has been marked for deletion/disassociation, submit it to your Project Officer for approval just like you would for any other work package. We hope these new options for you to remove and /or disassociate property records from your CA will make it easier for you to manage your data as we all work together to better measure the scope and success of the Brownfields program.